Vic Barnett, of the Dayton area, sent this to me the other day. In addition he sent a book of newspaper clippings that will be discussed in another blog. 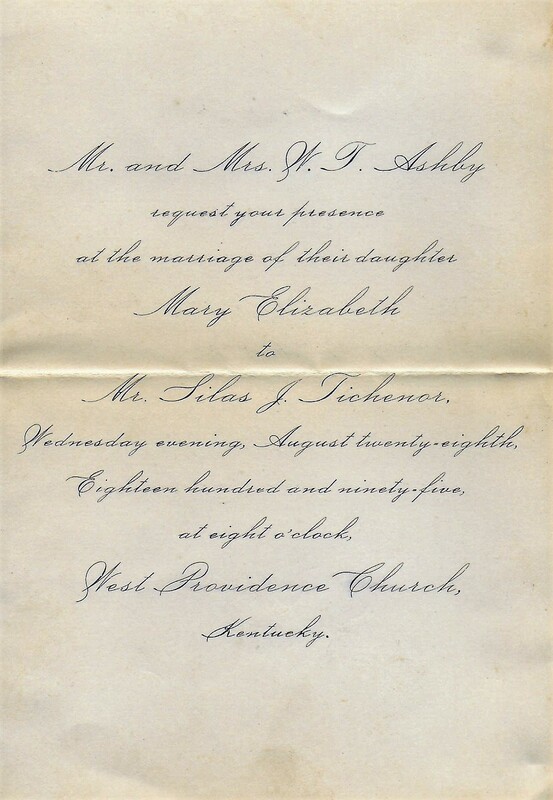 This wedding invitation intrigued me since I had not seen one this old. And I delved right in to find out more information about this family. I found Silas and Mary Elizabeth living with their respective families in the 1880 census for Ohio County. Silas Josiah was the oldest child of Byram Ebenezer Tichenor, 36, and Zelmar Dean Maddox, 33. He was 7 in this census. Sisters Sallie, 5, and Mattie, 2, round out their family. Mary Elizabeth, 9, was the daughter of William Thomas, 40, and Sallie Mary Ashby, 39. Margaret, 11; Lewis B., 6; Alverda, 4; and William, 2, are the remaining children. The Hartford Republican, in its Friday, June 3, 1892, edition lists the Hartford College Report, for the fourth term ending on that date. Silas Tichenor maintained a general average of 96, only one student with a score of 97. In the 1900 census of Ohio County Silas Tichenor is listed as 26, and was a merchant. Mary is 29, and one child, daughter Lilian, is listed as aged 3. In 1910 two sons are also listed, Silas Conrad, 9, and J. Russell, 3. In 1920 one additional child, Byram, is 7. At some point after this census, and before the next, this family moved to Wayne County, Detroit, Michigan. At the end of their lives Silas and Mary Elizabeth Tichenor were brought back to Ohio County and buried in West Providence Baptist Cemetery, along with many other family members. Silas died at the age of 81, April 16, 1953. In his obituary it was said the family moved to Detroit in 1927. He was survived by his widow, Mrs. Mary Ashby Tichenor, one daughter, Mrs. J. L. Thorp, of Detroit; and three sons, Conrad, of New Castle, Indiana; J. Russell and Bryam of Detroit. Mary lived another nine years, passing away at the age of 92 on May 5, 1962, in Detroit. Son J. Russell Tichenor passed away in 1957, leaving only a daughter and two sons to mourn their mother.